The other day I received the Refresh Vox Box from Influenster with lots of goodies in it to test out. 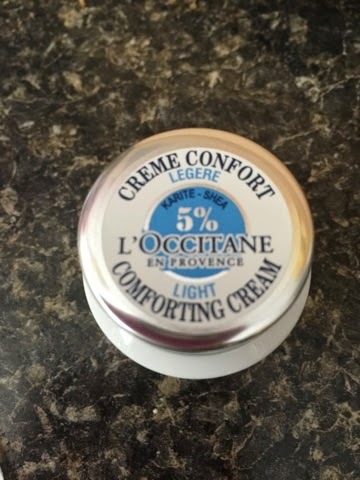 One of my favorite items was the L'occitane Shea Butter Comforting Cream. I really like this cream. I am usually a Ponds girl. I need something light that is non greasy and easy on my face. This lotion did a great job on keeping my face moisturized and there was no greasy feeling. After trying this product, I went into our local L'occitane store to browse their other products and I received a free facial. One of the products that was used in the facial was this cream. The staff in the store was so nice. They answered all of my questions and took the time to help me. That is what retail sales is all about and how to keep your clients coming back. Thank you Influenster for letting me check out this great lotion. I will be defiantly going to buy more. The Nifty Thrifty Family gives this product the seal of approval with a rating of a 5 in a zero to five scale. Please note that this review was solely of my own and the product was provided by Influenster for testing purposes only.